Hi there crafty folks, is it Autunm yet? I have another colourful treat for you! These are the Toadsies, two lovely free toadstool patterns. During one of those heat waves in this crazy hot Summer, I decided to distract myself by making Autumnal items, as a reminder good times are coming. Occasionally my hands got so sweaty even this lovely distraction wasn’t working all that well, but nonetheless I enjoyed my endeavours and they resulted in some very cool toadstools. 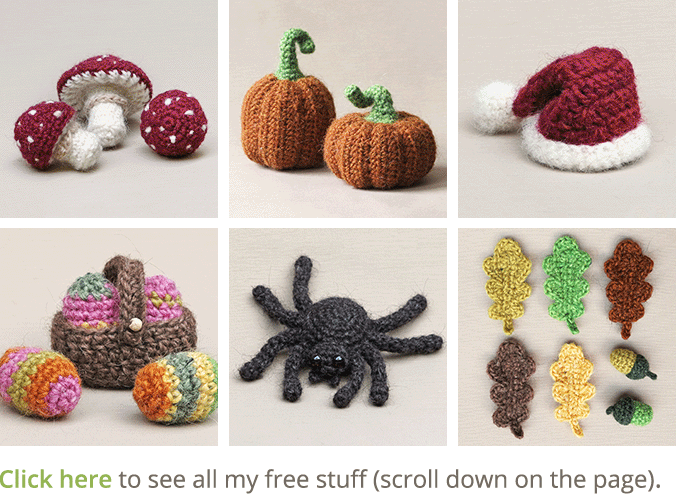 And what could be more rewarding than to share the lovely toadsies for free with you lot, my biggest supporters? Scroll all the way down to find the marvelous pattern, and if you prefer having an even more fabulous looking PDF of this pattern, make me a small donation and I’ll email you the pattern. But first a bit more about how I came up with these. As you can see, I made almost-true-size fly agarics. A young one, and a more fully grown version. We often come across these fungus when walking through our local nature, and I always love the moment I can take the first pictures of them with my phone. You know, from below to get that immense statue of a mushroom effect. In these cool pictures, you can get a good view of the spores and so I had to create them in my toadsies. 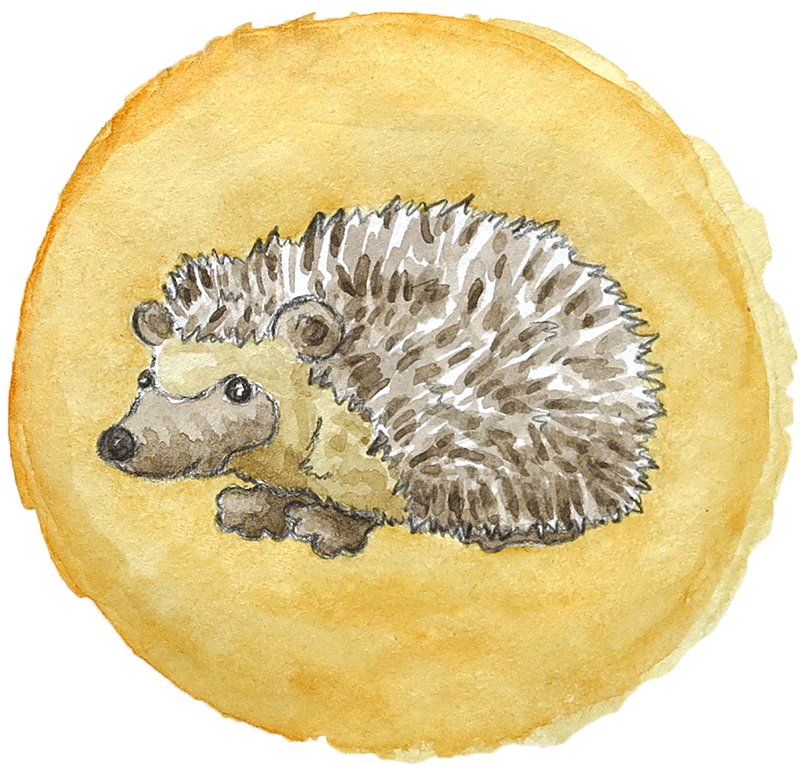 Also very important to me was to create different sizes of little spots, to get a realistic appearance. Making these was fun, I figured out pretty soon I could create the spores with treble crochet stitches, and the spots look totally “spot on” and even help to keep the toadsies in shape. And maybe the best thing about these I saved for last, you can make these crochet toadstools in one go. So go for it, I say! This pattern is written in standard American crochet terms. It’s useful to read it before you start. If you use the recommended yarn, your toadstools will be 9 cm / 3.5 inch high (wide version) and 7 cm / 2.8 inch high (small round version). 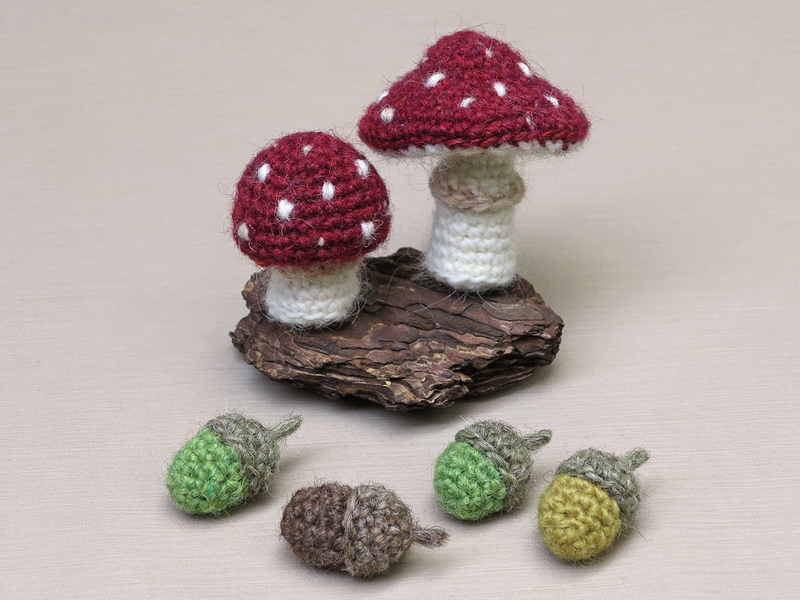 For these toadstools you’ll need worsted weight yarn and an E US/3.5 mm crochet hook. You’ll need three colours of (Lètt Lopi) yarn: red (1409), sheep white (0051) and barley (1419). A small amount of each colour will do. You will also need fibrefill to stuff the toadstools. The toadstools are worked in the round/ spirals. You can use a stitch marker to mark the beginning of a round. Move it up each time you start a new round. About changing colour: always change colour in the last loop of a stitch, so the loop on the hook you end with is the new colour. That means the next stitch is in the new colour, not the one you changed in. These toadstools are made in one piece. You start with the red colour to create the top. The first round of the white inside of the toadstool you will work in the back loops (BLO) only to create a nice folding line. In this round you decrease the number of stitches by half to create a flat inside; the dc’s & trebles will create the spores. After these rounds you will make a new folding line by working in BLO again, and then you work your way down to create the stems. Start in red, change colour to white and straw when indicated. 9. (sc in next 6, 2 sc in next) x 2, sc in next 6, sc in next, sl st in white in BLO in same = 24, cut red and continue in white. You have made that white sl st in the back loop to create the neatest colour change possible. Count the sl st as a st. I experimented and this little trick creates an almost straight red edge with as small a bump as possible. Stuff the first part of the toadstool. Stuff flexibly, leaving a little hole in the middle. Don’t just put the stuffing in but push it against the sides and mould the outside. The hole that is left in the middle you can use to shape the toadstool. Special stitch instruction for dc dec, this is worked in BLO: yarn over (yo) and insert your hook into next st, (yo) and draw the yarn through the st, insert the hook into next st, yo and draw the yarn through the st, yo and draw the yarn through 3 loops on the hook, yo and draw the yarn through the remaining 2 loops on hook. Now you can stuff the rest of the toadstool. It is important to stuff it flexibly and to shape the cap correctly by pushing the spores (dc stitches) inwards with both thumbs as you can see in the image below. When you stuff the stem, keep that shape in mind. 17. s2tog x 6 = 6, sl st and leave a very long yarn end for sewing and embroidering the little white dots. Sew the hole closed by putting the needle from the inside out through all the outside loops of the 6 st, clockwise. If you do it correctly, you can now pull the end and it will close the gap. Weave in the end so you’ll have a nice flat bottom. Don’t cut the remaining the yarn end but leave it long for now. After you’ve created the straw-coloured skirt around the stem, you will use the white yarn end to shape the toadstool and create the white dots. Find the first front loop of round 11 (the front loops closest to the stem) and attach your yarn to it with a sl st; sc in same, ch 1 & dc in next, sc in next, ch 1 & dc in next, dc in next, sc in next, ch 1 & dc in next, sc in next 2, ch 1 & dc in next, dc in next, sc in next, sl st in 1st st and leave a long yarn end to add some straw coloured spots to the cap. Step 1. First sew a stitch into the bottom of the cap between the front loop of rounds 10 and 11 and let the yarn enter above it somewhere in the red cap. Pull the yarn as tight as necessary and sew a stitch into the cap. Now make the dot as big as you like. Step 2. When the dot is the size you like, sew the yarn back to the white bottom of the cap without tension on the strand and take one stitch to secure the yarn. Repeat steps1 & 2 all the way around so the bottom of the caps stays shaped a bit inwards and there are plenty of white dots. If you like you can also add a few straw-coloured dots, that’s up to you. 9. (sc in next 5, 2 sc in next) x 5, sc in next 5, sc in next, sl st in white in BLO in same = 42, cut red and continue in white, like you did for the round toadstool. Special stitch instruction for treble dec, worked in BLO: yarn over (yo) 2 times and insert your hook into next st, (yo) and draw the yarn through the st, insert the hook into next st, yo and draw the yarn through the st, yo and draw the yarn through 3 loops on the hook, yo and draw the yarn through the remaining 3 loops on the hook. For the hdc tog: yarn over (yo) and insert your hook into next st, (yo) and draw the yarn through the st, insert hook into next st, yo and draw the yarn through the st, yo and draw the yarn through the 4 loops on hook. Stuff the first part of the toadstool like you stuffed the round version. Now you can stuff the rest of the toadstool, like you did for the round version. For this toadstool it’s also important to push the spores inwards as much as possible. 24. s2tog x 6 = 6, sl st and weave in yarn end. 1. sc in each front loop around, change colour to straw in last st.
2. sc in next, dc in next, 2 dc in next, sc in next 2, ch 1 & dc in next, dc in next, hdc in next, sc in next 2, hdc in next, sc in next, sl st in 1st and weave in yarn ends. Finish this toadstool like the small round one, but attach a new, long strand of white yarn close to the stem and use that to shape the toadstool and add the dots. In the image below you can see how I arranged my toadstool’s little dots. 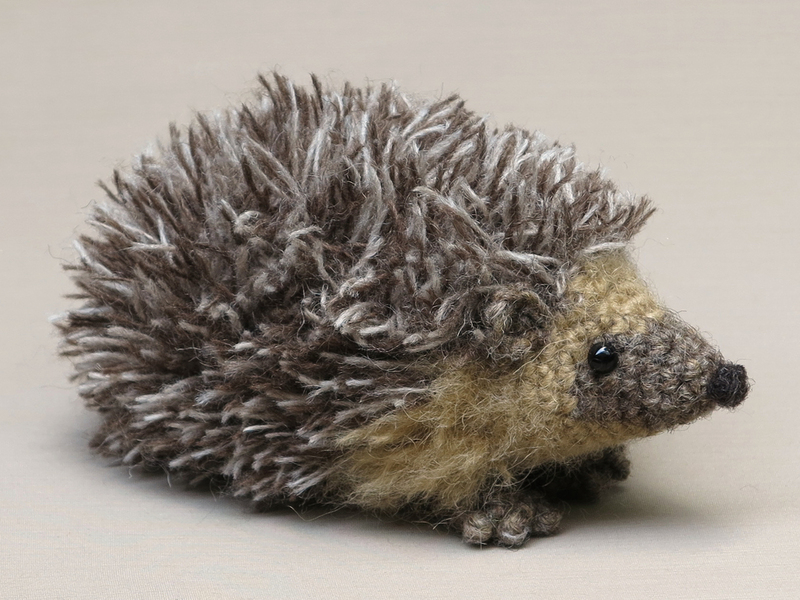 You can make as many of these as you like; try making one in orange or browns. Enjoy Autumn! 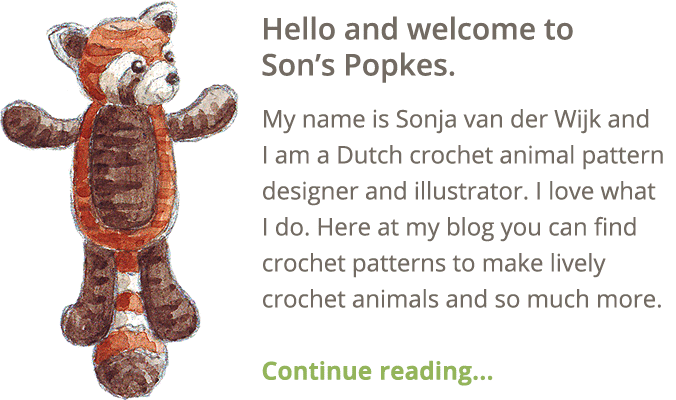 Copyright © 2018 by Sonja van der Wijk. Please do not reproduce this pattern in any way. My favourite time of the year has started and I wanted to share my joy by giving you something fitting & fun to make. What about a free pattern for these two crochet pumpkin cuties? The abundance of lovely free pumpkin patterns made it quite difficult to come up with something original. But I had my mind set on how the pumpkins should look. They had to be realistic, which meant the shape should have vertical lines instead of horizontal like when you crochet in the round. They also needed to have a smooth surface, so that when you create the characteristic pumpkin bumps, there aren’t any bumps in the way. I came up with these two pumpkins and love them. 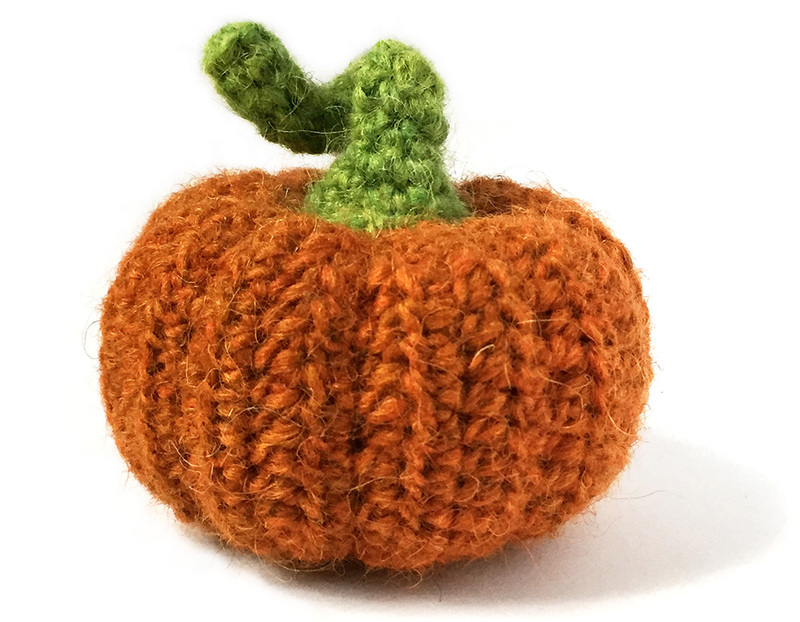 They have an almost knitted feel and if you use the recommended yarn, they are about the same size as those little pumpkins used for decoration. In the pattern, which you can find below these images, you can find all the info you need. And here it is, the pumpkin duo pattern, enjoy it! If you prefer having a neat PDF file of this pattern, you can donate me a little amount of your own choice and I will email you the pattern. This pattern is written in standard American crochet terms. 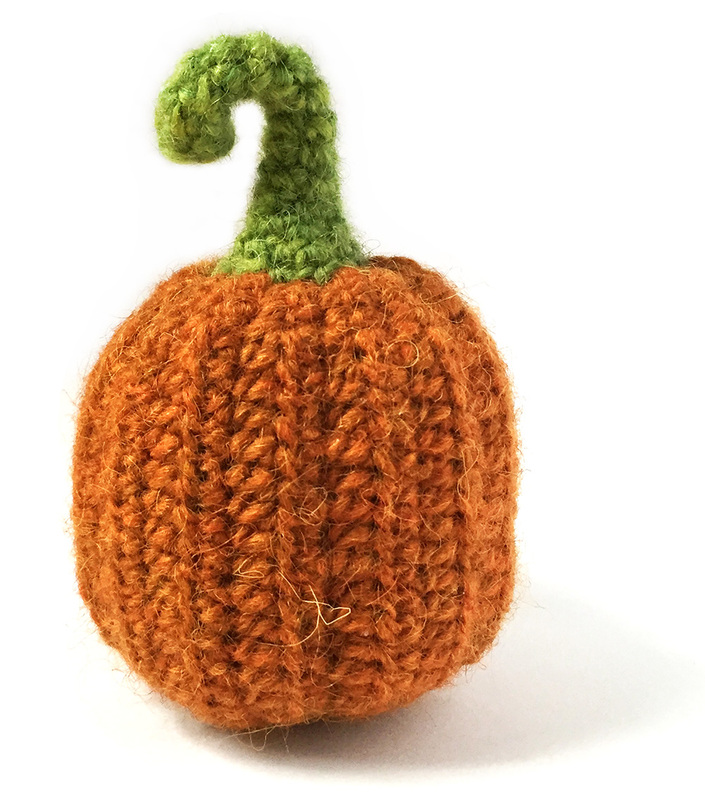 If you use the recommended yarn, your wide pumpkin will be 9 cm wide by 6.5 cm high without the stem (2.5 by 3.5 inch) and the high pumpkin 8 cm wide by 9 cm high (3 by 3.5 inch). 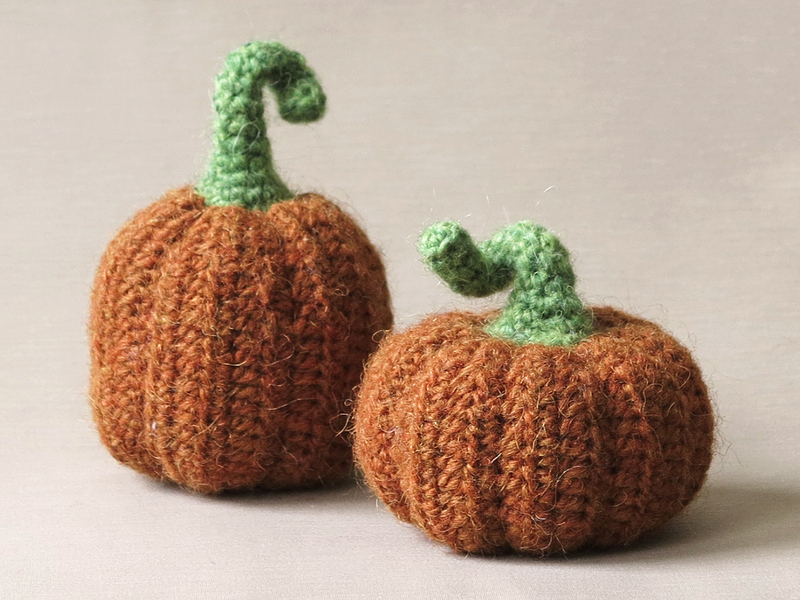 For these pumpkins you’ll need worsted weight yarn and an E US/3.5 mm crochet hook. The yarn I’ve used is Istex Lètt lopi, a 100% wool, you need two colours; orange (1704) and a small amount of green (1406). 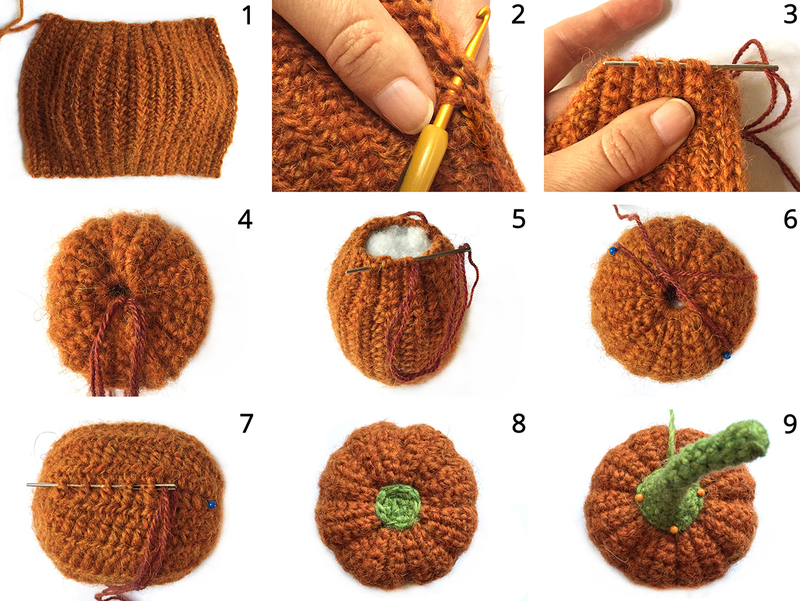 You can easily make 2 pumpkins with one skein of orange Lopi yarn. You will also need strong orange embroidery thread to close and shape the pumpkins and fibrefill to stuff the pumpkins. Pipe cleaners for the stems are optional. The pumpkins are worked flat in rows. After each row you do a chain 1 and then turn. The first stitch of each next row you do in the second chain from the hook. The stems and bottoms are worked in the round/ spirals. You can use a stitch marker to mark the beginning of a round. Move it up each time you start a new round. Wide pumpkin In orange and worked flat in rows. Leave a long yarn end at the beginning of your chain. 34. repeat row 2 but sl st in last and leave a long yarn end. Bottom patch In green and worked in the round. Make two if you make both pumpkins. 2. (sc in next, 2 sc in next) x 3 = 9, sl st and leave yarn end for sewing. Stem In green and worked in the round. Make two if you make both pumpkins. 14. (sc in next 3, 2 sc in next) x 3 = 15, sl st and leave yarn end for sewing. Skip the next part and continue with finishing if you are only making the wide pumpkin. High pumpkin In orange. Work flat in rows. Leave a long yarn end at the beginning of your chain. 32. repeat row 2 but sl st and leave a long yarn end. Below this section you can find step by step images of the process. Read this whole section before you start sewing, to get a complete idea of how it works. Slip stitch together the side edges of the pumpkins. Fold the piece in half, wrong side out if you have a favourite side. Insert your hook through the 1st loop on the edge with the starting chain and through both loops of the stitches on the edge you ended with, yarn over and finish the stitch as a sl st (photos 1 and 2). Work your way like this till you reach the end. Turn the piece right side out so that the slip stitched seam is on the inside. Use a strong embroidery thread to close the bottom; you don’t want it to snap when you pull it tight (I used it doubled to be sure). Leave a long end at the beginning for a knot and sew it clockwise through the highest stitches on the outside of the edge (photo 3). The stitches aren’t all easy to see, but if you sew through 3 out of 4 the little trick will work. When you’ve worked your way around, tie a knot with the beginning of the strand and pull it as tight as you can, leaving the smallest gap possible (photo 4). Secure your knot and work the thread ends to the inside. Stuff your pumpkin. When you stuff it, push the stuffing outwards to prevent the pumpkin from getting stretched in length, leaving a hole in the middle that you can fill last. If you have stuffed it correctly, your stuffing sits close to the edge but doesn’t bulge out when you knead your pumpkin. Now your pumpkin is ready to be closed. Do it the same way you closed the bottom (photo 5). When the pumpkin is closed, it needs a bit of extra shaping. Attach a very long strand of the strong embroidery thread to the edge of the hole at the bottom. Leave a long end to tie knots with and make sure the rest of the strand is long enough so it can encircle the pumpkin a few times. Encircle the pumpkin with the strand once and mark the path (photo 6). Now start at the beginning and sew under and then over the stitches of the path you chose (photo 7). When you are at the bottom again, pull the yarn as tight as you think looks good and make a knot with the beginning. Now repeat this step a few more times to create the right pumpkin shape. When you are satisfied, sew the last end of your strand a few times from the bottom to the top to create a nice dent in the middle (photo 8). To finish your lovely pumpkins, attach the bottoms and the stems. The bottoms are sewn between the stitches of the edge of the bottoms, so the shape stays the same (photo 8). When you attach the stems, insert a pipe cleaner first if you want the stems to be bendable and insert the end into the pumpkin. When you sew the stem on, sew over the edge and into the pumpkin to create an invisible seam (photo 9). Enjoy nature’s change of seasons! 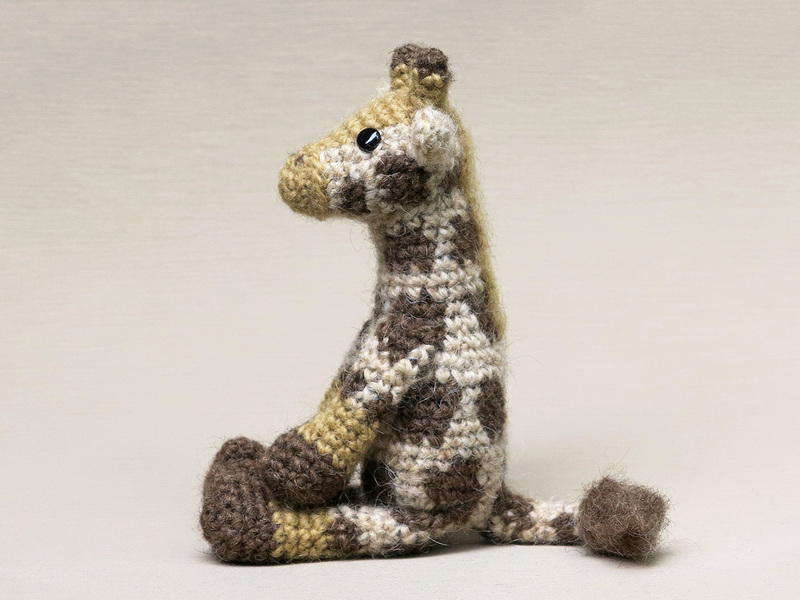 Very proud and happy I present to you my jolly new pattern, Matisse the giraffe. 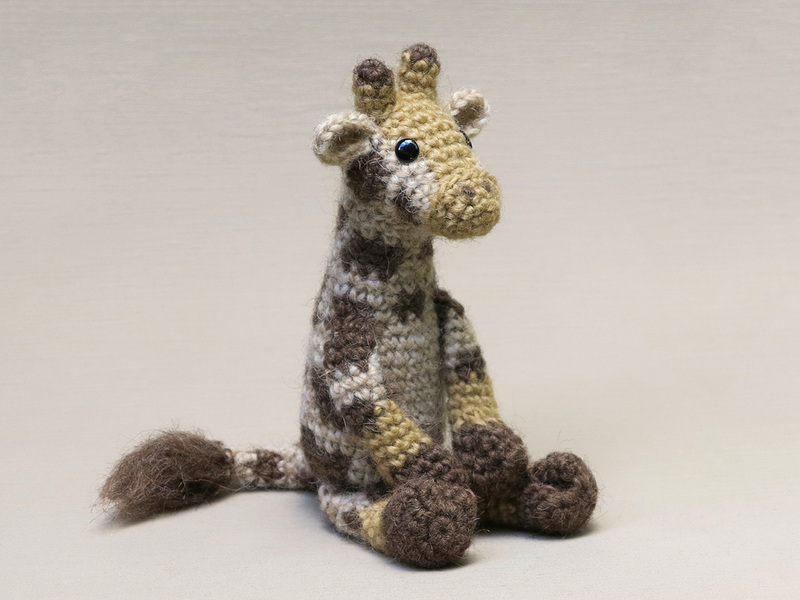 When I started designing this crochet giraffe amigurumi I loved the challenge and was excited by the idea of creating a realistic and cute giraffe doll. And I have to admit, I even surprised myself with the result. I think my giraffe looks absolutely fabulous! When the head was pinned to the first prototype body, I was stunned with how it looked, somehow I managed to get the spots in excactly the right place to get a perfect giraffe skin, it was amazing. A a few little adjustments would make everthing look ‘spot on’, but the main shape was just right. 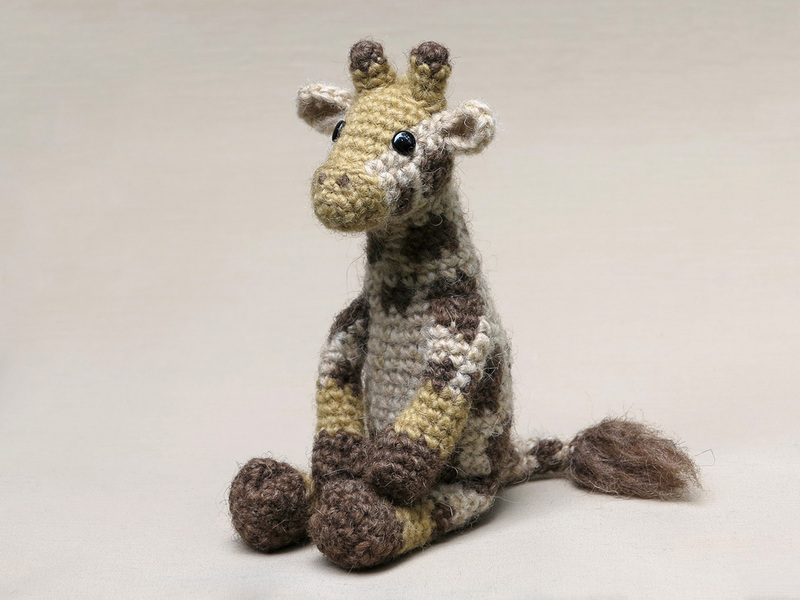 As for all my crochet animal patterns, my giraffe had to have a realistic appearance. The spots are very important to achieve that. Real giraffes have many spots, the further down their body the bigger and there is some sort of pattern in them, like water puddles on the beach when it is low tide. I knew that with my limited number of spots, most important was to resemble that look. Another special thing about this giraffe are his long ‘arms’. 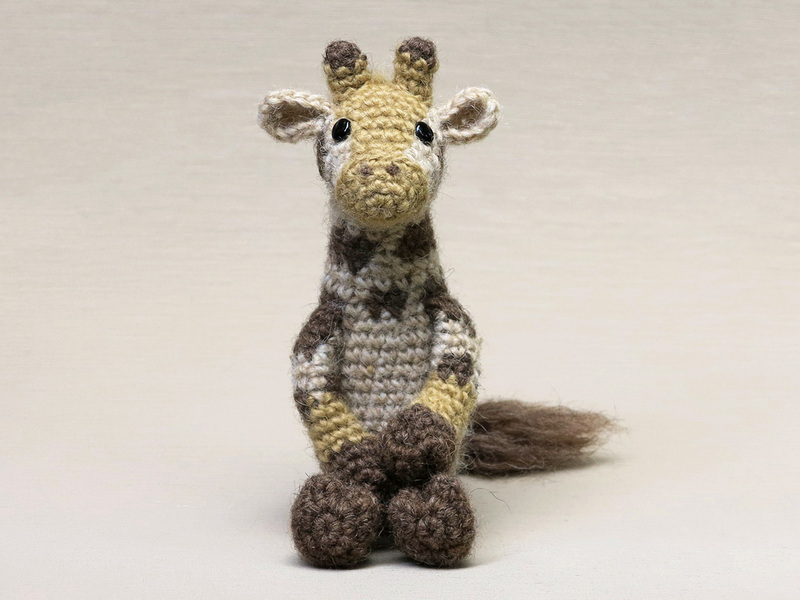 Giraffes are special looking creatures with their long necks and diagonal backs and because I wanted to make a doll shaped giraffe, it is a bit hard to reproduce that look. I think the longer arms do suggest that shape and also make this doll able to sit in different positions. I just love it when Matisse sits forward with his front paws between his legs and like that he even gets that unique giraffe shape. I hope you crafters are just as surprised and happy with this doll as I am! Matisse is made with Istex Lett Lopi, a 100% wool with a lot of fuzziness. He is 6.5 inch/ 16,5 cm when sitting. 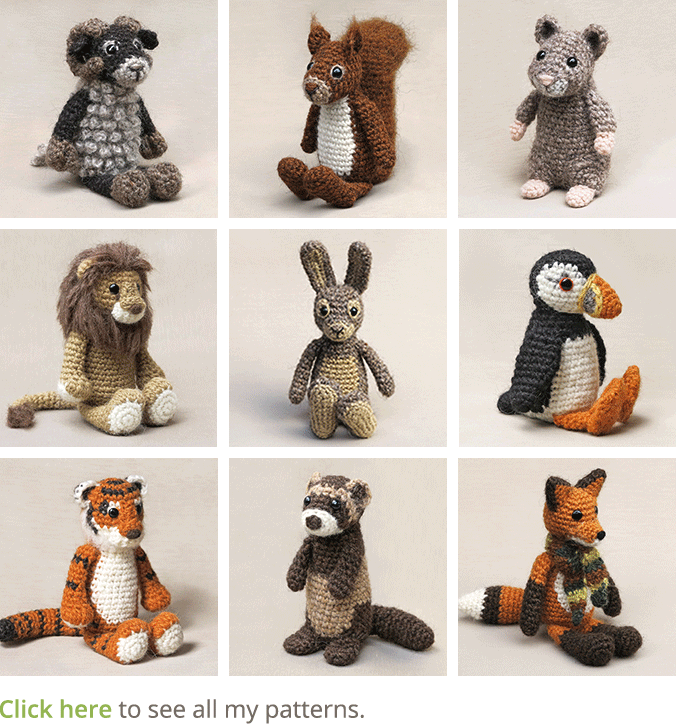 The pattern is written in standard American crochet terms and contains a clear and colour coded description of how to crochet and assemble this animal, with extra illustrations and example pictures at the bottom to help you get everything right. 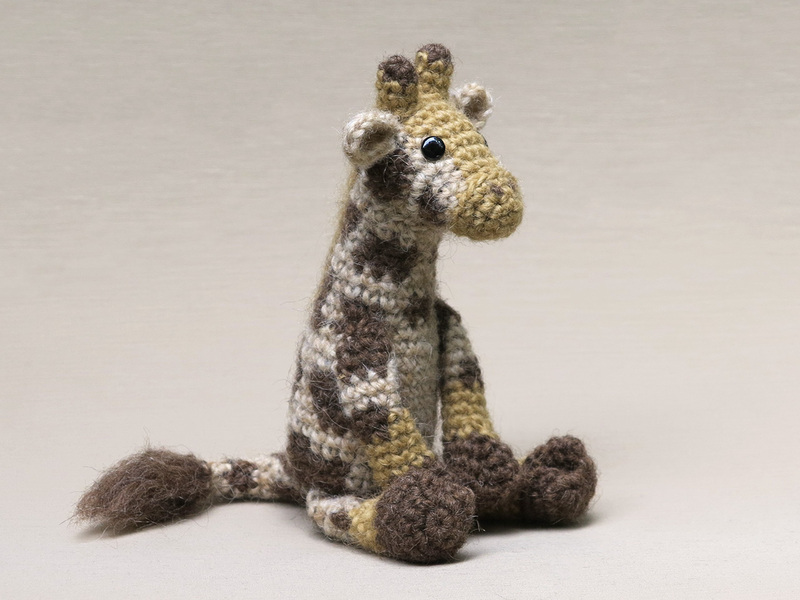 In the pattern you can also find what materials you need, the yarn colour numbers, in short, everything you need to know to make your own realistic and playful crochet giraffe amigurumi. All the additional information you need to know about this pattern you can find in the shop listings, like the yarn you need etc. You can buy this pattern in my shop at Craftsy and in my shop at Ravelry or order it here. This pattern has a one dollar release discount till Tuesday the 3rd of July!